Redfern End of Days – the 107 blog. Redfern End of Days was an exhibition of paintings by James Stephenson held from 10th May 2017 – 21st May 2017. 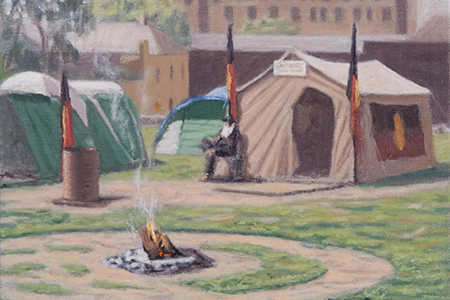 Redfern End Of Days is a series of plein air paintings depicting the life of the Redfern Aboriginal Tent Embassy, a protest movement seeking Aboriginal housing on Redfern’s iconic ‘Block’. Beginning in mid 2014, the embassy was dismantled fifteen months later. Featuring works in oil on linen painted in situ during regular visits to ‘The Block’, this series celebrates daily life at the camp, and culminates in a work which depicts a protest march and rally at N.S.W. Parliament House in Sydney. Exhibition Documentation by Campbell Henderson.